It’s been a quick start to the year for Lee Morton who started business less than six months ago after purchasing the Cardiff territory. Lee (pictured with CEO Jason Sayers) has big ambitions of growing a multi-van operation after meeting with other franchise owners at this years Filta franchise owners conference. Bristol (BS) postcode. I’ll then get both vans running at full capacity before looking to add another employee and a further 3rd van to my business”. “I have only been within the Filta set up for a few months but already it is significantly better and more professional than my previous experience with a franchise and it reaffirms that I made the correct decision to invest” said Morton. “The support I’ve been given from the head office, in particular Damian Slater the Franchise Manager, has been second to none. Filta have even recently agreed to sponsor my sons football team, Caldicot Town AFC juniors which is a gesture most appreciated by all involved and another example of the support provided” said Morton. 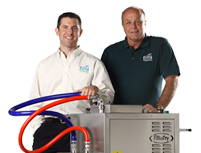 The above case study is just one example of how quickly the Filta franchise network is growing, with not only new franchise owners purchasing territories but also existing owners and even Filta customers! If you want to know if your local territory is available then getting started could not be easier… simply Click Here and we’ll get the territory maps ready and schedule a good time to chat.